Greece has 6,000 islands of varying sizes scattered throughout the Aegean and Ionian Seas. Only 227 of them are inhabited, each with its own distinct character and flavor. 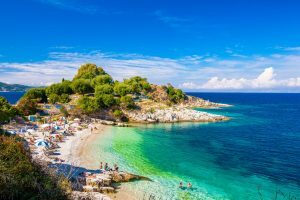 With its postcard-like scenery, stunning water, unspoiled beaches and lovely people, it’s obvious why the Greek Isles are one of the premier paradises on earth. Combine the natural beauty and perfect weather with ancient history and delicious cuisine and it’s easy to see why it is among the world’s hottest tourist destinations. From the iconic whitewashed houses and blue domed churches to rugged rock formations surrounded by lush greenery to well-preserved ancient castles, the beauty of the Greek Islands is diverse and abundant. And from very small like Syros and Paxos to the largest island, Crete, they come in all shapes and sizes. There are so many reasons to visit this spectacular paradise and although you probably don’t need convincing, here are five of them. This one is the most obvious, but what you see in pictures is really what it looks like! From serene white beaches with beautiful turquoise waters to the crystal-clear blue water beyond the shore, it’s all simply spectacular. Words really can’t describe it, so here’s a picture. The diversity of the islands adds to the beauty, from secluded and tranquil to popular and bustling. Each island has something unique to offer. 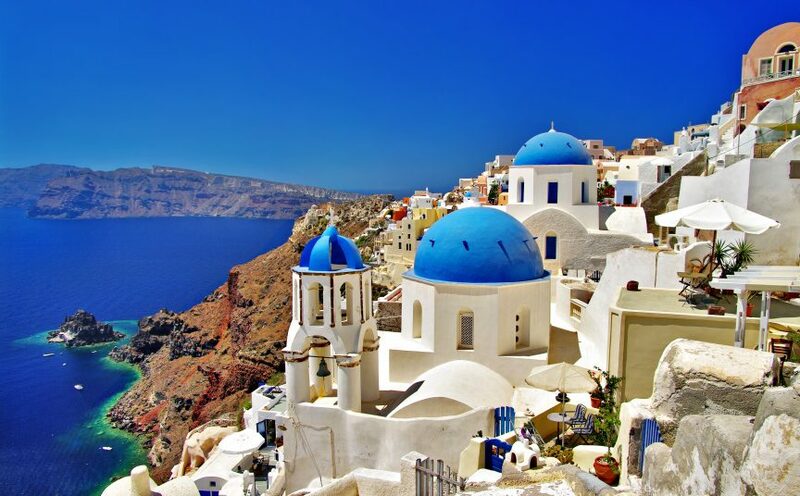 As you can see in the first picture (Santorini), the white buildings and blue domes set against the bright blue sea on rocky seaside cliffs is the most iconic image of the Greek Islands. 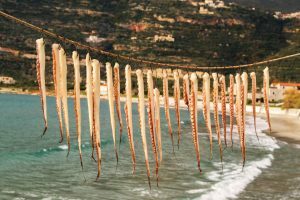 These can be found in Mykonos and Santorini, the quintessential islands of Greece. While they are both known for their famed scenery and old-world charm, they are very different. Mykonos is perhaps the most famous Greek island, attracting tourists and international celebrities since the 1950s. 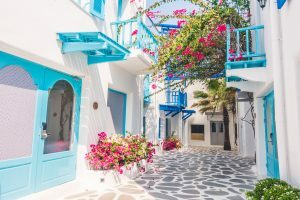 Beyond its exceptional sandy beaches and signature 16th-century windmills, the town of Mykonos (Chora) is a cobblestone labyrinth with shops, award-winning restaurants and luxury hotels. It is also known for its wild side, referred to as the party animal of the Cyclades for its vibrant nightlife. Santorini is much more laid back despite being an active volcano, known for its scenery, caldera and volcano views, famous sunsets, wineries and tours. Its beaches are not sandy like Mykonos, instead made up of black, red and white lava pebbles. It has a more romantic feel than Mykonos, making it a popular honeymoon spot, and is the most visited Greek island. 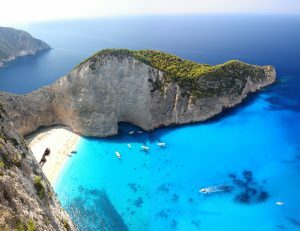 Greece enjoys more than 250 days of sunshine per year (that’s 3,000 hours! ), making it the sunniest country in Europe and one of the sunniest in the world. The island of Rhodes is considered one of the sunniest places in the world with about 300 days of sunshine per year. Referred to as the Cradle (or Birthplace) of Western Civilization, history and Greece go hand-in-hand. Greece is home to 18 UNESCO World Heritage Sites exhibiting its ancient cities, architecture and artefacts. Civilizations on the islands date back to 3000 BC with The Minoans. As for drinks, ouzo is a Greek favorite and the most famous Greek spirit abroad. This dry anise-flavored aperitif is very popular across the islands, especially in Lesbos (or Lesvos), home to 17 distilleries accounting for 50% of Greece’s production. Greek wines may not be as famous as other nations’ wines but as one of the oldest wine-producing regions in the world (since around 2000 BC), they have plenty of high-quality wines that are gaining popularity worldwide. 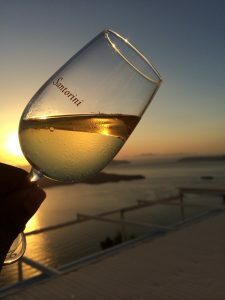 Some of the most famous Greek wines are from Santorini, including Assyrtiko (white, most widely-grown grape on the island), Vinsanto (dessert wine) and Mavrotragano (red). Mandilaria is a red grape grown throughout the islands. Some other popular Greek wines are Agiorgitiko (red), Retsina (white), Vidiano (white, from Crete) and Moschofilero (white). If you’ve always wanted to experience the beauty of this dream destination you’re in luck! We have two amazing cruises planned for 2019, the Mandy Connell Cruise on a private yacht July 25-August 4 and Paul W. & Kim’s Dream Vacation aboard the Celebrity Reflection September 28-October 12 (along with Barcelona, Sicily, Malta and Palma de Mallorca). Call 800-383-3131 today to reserve your spot on these once-in-a-lifetime voyages!